The End of an Era. Can the Commorancy survive? 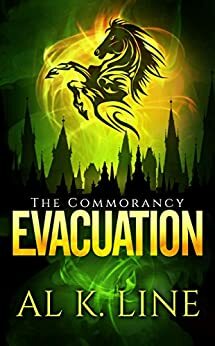 Evacuation continues the story of Marcus and his guests from the Commorancy as they attempt to outrun Varik and the Eventuals. Now on the mainland and encountering a world that many have not been a part of for centuries, the group wanders seemingly aimlessly with a destination known only to their leader. As the group makes their way toward their final destination, their numbers dwindle, leaving Marcus, Letje, Arcene, Fasolt, George and an unlikely ally in Bird left to face the final confrontation with Varik. Evacuation serves to close out the “Marcus” storyline of the Commorancy series and set up Letje as his successor. I felt this was achieved quite nicely and I loved the reintroduction of Arcene into the mix. Having previously read the Arcene series of books prior to this parent series I couldn’t help but laugh out loud at a few comments made by Marcus and others with regard to just how much of a handful this now 10-year-old child would become in years to come. I also found the exchanges with Arcene and Fasolt particularly entertaining with regard to the latter’s clothing choices… or lack thereof! We definitely see Marcus’ grasp on sanity waning, both at the Commorancy and on the road with the group as this dual existence comes to a final and definite end. A few sad moments aside, still a great read.